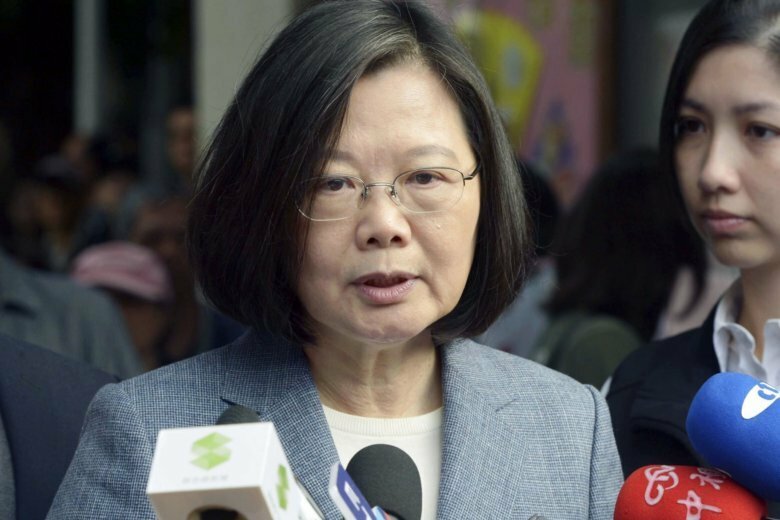 BEIJING (AP) — A strong showing by Taiwan’s opposition Nationalist Party in local elections over the weekend presents a major challenge to independence-leaning President Tsai Ing-wen as she grapples with growing economic, political and military pressure from rival China. While Saturday’s polls were largely decided by local concerns, Beijing cast a heavy shadow after two years of unrelenting efforts to restrict Taiwan’s participation in international society and advertise its threat to use force to bring the island under its control. Tsai’s Democratic Progressive Party lost power in its southern stronghold of Kaohsiung, while the Nationalists notched up 15 wins in the 22 major races being contested. Independent Ko Wen-je appeared to have won re-election in Taipei, the capital, although his Nationalist rival Ting Shou-chung has filed for a recount. The DPP won just six major races. Analysts and local media cited dissatisfaction with Tsai and the DPP rather than approval for the Nationalists, also known as the KMT, as a prime reason for the outcome. “Rather than thinking that Saturday’s results were because the KMT did a good job in opposition, it is more accurate to say they were due to voters’ overwhelmingly negative perception of the DPP,” Eric Yu of National Chengchi University’s Election Study Center was quoted as saying in the Taipei Times on Monday. Another factor cited was the Nationalists’ Han Kuo-yu, who ended 20 years of DPP rule in Kaohsiung by soundly defeating his DPP rival, and seemed to galvanize opposition to the status quo under Tsai. While his candidacy received little initial support from the party establishment, Han rode a wave of grass-roots support and went on to stump for other Nationalist candidates, adding momentum to the Nationalists’ sweep. Although China claims Taiwan as its own territory, it had largely withheld overtly intervening in the elections despite accusations of spreading disinformation. China has sought to isolate Tsai over her refusal to endorse its “one China” principle that designates Taiwan as a part of China. However, a spokesman on Sunday was quick to cite the election results as evidence that Taiwanese were becoming fed up with Tsai’s approach. The outcome “reflected the strong will of the public in Taiwan to share the benefits of peaceful development across the Taiwan Straits, and their desire to improve the island’s economy and people’s well-being,” Ma Xiaoguang, spokesman for the Cabinet’s Taiwan Affairs Office, was quoted as saying by China’s official Xinhua News Agency. “This lies at the core of Taiwan’s democratic values, which Beijing should respect and correctly understand,” the Mainland Affairs Council said on its website. “The only correct way to advance prosperity between the people of the two sides and eliminate differences is through communication and exchanges without political preconditions,” the council said. The true impact of China’s pressure campaign was difficult to gauge. Taiwanese voters are notoriously capricious, often changing sides based on their feelings toward a particular candidate, rather than over principle or policy. While the vast majority favor maintaining Taiwan’s de facto independent status — as Tsai has done — they are also deeply concerned about falling behind China in the financial stakes, as working on the mainland has become an ever-more appealing option for young Taiwanese facing wage stagnation and limited markets at home. Tsai resigned as DPP head on Saturday once the election results came in and now faces a considerably more hostile landscape as she contemplates running for re-election in 2020. Beijing has shown no sign of easing the pressure on her administration and is expected to begin wooing the more China-friendly election victors such as Han and the Nationalists’ Taichung mayor-elect, Lu Shiow-yen. Tsai’s efforts at reforming the government and economy have also encountered headwinds, particularly her push to reduce generous civil service pensions. “The election results are a major warning to Tsai’s governing team,” said Frank Cheng-shan Liu, a professor at National Sun Yat Sen University in Kaohsiung, who predicted increased friction within the DPP and greater difficulty in pushing Tsai’s reform agenda. However, Liu said the results had far less to do with Tsai’s refusal to recognize the “one China” principle than with dissatisfaction over economic growth. While expected to grow at a relatively healthy pace of 2.6 percent this year, Taiwan’s high-tech economy is generating fewer opportunities than in the past, while disparities in income are growing. China’s best option would be to stay low-key, since increased hostility could build resentment and shore up support for Tsai ahead of the 2020 election, Liu said. “To play the friendly card is the best way to win the people’s heart. If China continues to suppress Taipei, it will produce a counter-effect,” he said. Elsewhere over the weekend, voters in China’s semi-autonomous region of Hong Kong elected a pro-establishment politician to the legislature in a by-election called after the incumbent was ejected from the body for “improper oath taking,” one of six pro-democracy legislators ousted on that charge. Chan Hoi-yan’s sizable victory in the Kowloon West constituency ends the opposition’s hopes of regaining veto power in the assembly and continues to reduce the influence of the pro-democracy camp that has been shrinking since widespread 2014 demonstrations fizzled out with little result. China took control of the former British colony in 1997 under a system whereby it was to retain its own economic, legal and political systems for 50 years under Beijing’s overall guidance. The disqualification of pro-democracy candidates and demands for loyalty to China’s ruling Communist Party are undermining confidence in the “one country, two systems” framework that has also been offered to Taiwan, said Ivan Choy, a professor of government and public administration at the Chinese University of Hong Kong. That has produced a “negative example” for Taiwan in terms of faith in China’s promises and enthusiasm for unification with the mainland, Choy said. “The deteriorating situation of the human right and freedom in Hong Kong would build up a negative demonstration effect to Taiwan,” he said. EDITOR’S NOTE — Christopher Bodeen has covered politics in China and Taiwan for The Associated Press for more than two decades. Associated Press reporter Alice Fund contributed to this report from Hong Kong.